This is what it looks like when we drop off the puppies. I have shipped puppies/dogs all over the United States including other countries. Shipping is quite easy, only difficult when dealing with weather conditions and airlines. Remember that each airline has its own variations on regulations and services. When making reservations note there are a restrictions on the numbers of animals permitted. Some days are not always available as someone else might of booked that day already. Everyone wants weekends but that is usually not always an option. Some flights are delayed or cancelled and another shipping time may have to be arranged. We try to get flights that are closets to your airport and some you might have to drive to get there. We can not guarantee days of flights, due to weather and overbooking we can be limited. We ship by air and offer shipping anywhere in the continental United States if permitted by the airlines. We can ship to other countries but it will take some leg work on my part and fee’s and so on associated to that will be sent via email. You may have to take a day off work to pick up your new pet. Where we ship out of is at our discretion. We use United Airlines and Delta nothing else is acceptable unless we agree upon. Federal Regulations and State Laws! All puppies and dogs over the age of 12 weeks will be required to be vaccinated for rabies. This is not an option. This required by the State and Vet. The cost is $45.00 the buyer will be responsible for this cost plus the price of shipping. Take the rabies certificate to your local lic. authorities where you live and they should give you a new rabies tag for your pet. Please note some of our shipping policies have changed due to Airline changes. We sometimes learn of the changes on a short notice and have to make changes without notice. If possible we like to ship multiple puppies together making it less stress on the puppy. We do not like to ship on the weekends due to the airports not being able to take cargo. We do not ship on Holidays unless approved by me. We do not ship in the early a.m. if it conflicts with the kids going to school/events. How long does it take to ship, depends on how fast and what payment method you are using. Usually, a 7-10 day turn around but it can be longer depending on the Veterinarian schedule and what is available. I have been asked this many times about someone sending a crate owned by them. Sorry, at this time we will not accept outside crates to be sent here to ship the new puppy. We will not use Delta if they need to make a connection into Atlanta, GA as they have many issues in that airport. Absolutely no exceptions! 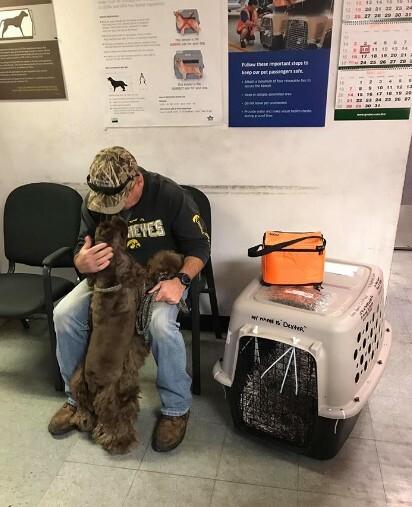 The puppy usually will have one to two layovers depending where the puppy is shipped out of and where the puppy is going. The airline usually feeds and waters the puppy when they are on a layover. In my experience the airlines and flight attendants really love and enjoy playing and feeding the puppies. I do recommend after the puppy has arrived to not push food right away. As they might be a little air sick. Kind of like car sick I wait about 15 minutes and then feed and water them, only a little at a time at first. Let them out to go the bathroom and stretch their legs at home, not in a public area, not at the airport and especially not at a dog park. We are using United Airlines starting August 2018 and some times have to use other airlines. Prices go up or down as it goes by weight at the time of check in. (Note this is for Airfare ONLY) We have no control over theses charges! The charges listed below are only approx. and may be more or less. On puppies older than 12 weeks of age. I am very sorry about the price increase but I can’t control the airlines and neither can any other breeder. what is allowed by the airline. will still have a flat rate cost and will have to eat the difference of if there is extra we will gain the difference. No exceptions. What does this mean, you the buyer? You will have to travel maybe 4 hours or more each way to pick up your puppy during that time frame. Right now these are the 4 places we can not ship into during that time frame but there are ways around it. Example- United no longer will ship to Phoenix but will ship to Las Angeles which is a 5 hour drive. I can will be able to ship the puppy to LAX but you will have to go and pick your puppy up from LAX and pay whatever cost for fuel, lodging and so on to get your puppy. 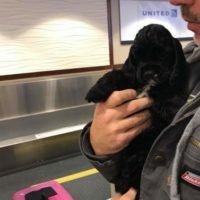 The other change in United policy is that we the shipper must give five (5) days (minimum) prior to travel to book a flight, that means there is going to be at least a 5 day wait to get your puppy unless United allows change, plus the time to get the puppy to the vet for the Health Cert. You must get shipping funds together immediately so I have them available to use for shipping within that time frame. FYI- Our shipping price are not set in stone it is just an approx price that does not mean that will be the price the day of shipping. Sometimes it is much more than the price quoted and I pay the extra cost. Also it can be much less than expected. Therefore any money that is left over for the price quoted to you for shipping will not be refunded back you no matter how much it may be for absolutely no reason – just like the money I may have to pay extra will not be given back to me. No matter if you are shipping one puppy/dog or multiple puppies. FYI- It is totally different from telling you a price and what happens at the airport. You can have two puppies going out together two charges for shipping and they can’t fit them on in two crates but can in one. So we always bring extra crates with us. Therefor the price in that shipping the weight would be larger for the two puppies but the price would drop. That money would not be refunded. There are a lot of what if’s in shipping, the airlines go by weight and also size of crate. There are so many manufactures of crates and so many sizes and each airlines says type 100 are this well that might now be the case, what may be a 100 in one airline might be a 200 with another airline. It is so confusing at times. It is up to the airline and I, how the puppies get to you. There may not be enough room on a flight or other issues to why we do what we do on our end. We PAY: We cover the gas to drive to the vet and back to get the Health Certificate, we even pay for the Health Certificate, water container and food container, shredded newspaper, tape if need be to attach paperwork, zip lock baggies for food, zip strips for crate, plus the wear and tear and my truck for things like tires, oil changes, possible speeding ticket if running late, extra miles on my truck and it is a pretty long drive there and back which is a minimum drive of 2 1/2 hours there and back. We also contact the person receiving the puppy letting them know that we have dropped the puppy off with the airline. We hope that we get the same consideration on your end letting us know that the puppy has arrived. Sometimes we take photos if I bring helpers such as my husband and kids. Here are two girls that shipped out of Sioux Falls, SD airport on 12/9/2017, on this day I was in constant contact with the new owners. Taking photos of the girls in a crate in the backseat of my truck while heading to the airport, when we arrived I let them know that we made it and shared these photos. I also contacted them via phone and let them know that they were left at the airport and on their way. I was also letting them know that the plane had landed in Phoenix as I was tracking it. Then after they picked up their puppy they called me letting me know they got their puppies! The excitement in their voices is very heartwarming to the point at times I cry. 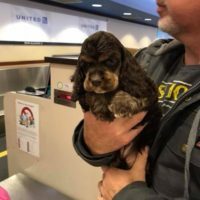 If you would like to fly in to get your puppy that is possible, we can deliver to Sioux City, Iowa (American Only) and out of Sioux Falls, SD they have American, Delta, Frontier and United Airlines, but must agree prior to the deposit and noted on which airport you will be flying into. We charge a $100.00 fee to cover the cost of gas which is due upon delivery in Cash only. If your puppy is over 12 weeks old there is also the cost of $45.00 for a rabies. You will be responsible for the cost of traveling with your pet including meeting the airlines rules and regulations and the flight will be at the buyers expense. Meaning there usually is a fee for the airlines to fly with the puppy which the last time I checked was $125.00 (May be higher) plus you must still have a Health Certificate which I provided and a soft sided crate (you must provide). All expenses will be out of pocket. You will be responsible for booking a flight for you and your puppy, however you will have to make sure before you book it that day works for me to deliver the puppy as it is a 2 1/2 + hour drive both directions. Flight prices do change per day, per week and per month. We are not responsible for any extra charges if flight price goes up or down if you are coming to pick up your puppy by flying in and taking him/her with you. It absolutely will not effect the purchase price of the said puppy. If for any reason a health certificate has been done and you cancel your plans to pick up your puppy at a agreed time and place and a 2nd health certificate is needed the cost of the 2nd health certificate will be at the buyers cost. If for ANY reason the Buyer does not complete the purchase including sending shipping before the puppy is 8 weeks of age, all money placed on the puppy will not be refunded or transferred to a different litter or any puppy in that litter and any funds paid on the puppy is then forfeited to the Breeder. There is no holding of a puppy after 8 weeks of age unless there is a weather related issue and we are unable to ship. The price of the puppy/dog is to be paid before picking up or shipping of any puppy. If the puppy is for sale and older than 8 weeks of age, you will have up to 2 weeks to pay shipping or all funds will be forfeited to the Breeder. 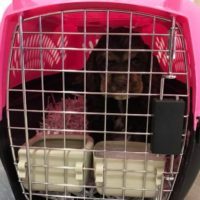 If you are purchasing a puppy 6 months or adult cocker you have up to 2 weeks to pay shipping or all funds will be forfeited to the Breeder. We are not in the business of holding puppies or adult cockers we are not a boarding facility.The only case that we may hold a puppy is when we are willing to work with you and that is brought up prior to putting a deposit on a puppy/dog. We do hold on a limited basis but both parties know what is expected. Shipping has to be prepaid before leaving to their new home. I do not want any puppies left at an airport unattended is why prepayment of shipping is required before hand plus some airlines like United require shipping be prepaid. All puppies that need shipping will need to be examined by a Vet and have a Health Certificate and Acclimation also a proper sized crate according to airline regulations. The crate has to be airline approved. We DO NOT ship the papers with the puppy/dog, do not expect the papers to be with them. able to take that information and go directly to AKC’s website and register your puppy online within minutes. Within 1 to 2 weeks they should arrive to your door with your name on them. You send me the shipping money by the form of the accepted type of payments listed. Once shipping money is received I will start calling or wait till it is time to get ready to ship. I can only schedule shipping through an airline 7 days prior and the earliest 24 hour notice. I will need some information from you first. First and Last name, address, phone number including alt. phone number. I then will ask you what is the nearest airport and then the next airport at least three airports in your area. I do know that some airports might be a ways away, do know that some are a drive, that is why I try for first choice. I first call the Vet to schedule an appointment to for a Health Certificate and Acclimation. I call the airlines for a connection. Once I find a airline I set up a time for shipping the puppy. Usually the puppy will leave in the early morning. Sometimes that puts me leaving my house at 1am to be at the airport by 5 am. It usually is a 2 1/2 hour drive to the airport each way for me if not longer depending on traffic. I have to be to the airport and the puppy has to be booked in 2 hours in advance. The crate has already been purchased. The crate has been put together and holes have been drilled by my husband if needed to add extra bolts. We have shredded newspapers and have a bag ready to take with us for the bottom of the crate which is considered absorbent material. The puppy at this point has been groomed the day before and bathed. puppy will be able to lick it while they are in the crate during flight. We take it in a cooler on the way to the airport so it stays frozen. The night before is usually a pretty late night trying to stay up and keeping awake and knowing I have a huge task at hand and a long trip to the airport. At this point we are checking and double checking as to what needs to be done to ship the puppy. Making sure we have added zip strips to the crate as added protection. Making sure we have all the proper paperwork such as the health certificate and two copies of them. Having paper towels in case of an accident, bringing extra zip strips, towel to put the puppy on for the ride to the airport. Making sure not to forget the water dish that is in the freezer, getting a baggie with puppy food in. We make sure the puppy has ate and went the bathroom before we leave. Once we are ready to leave we usually pack the crate in the backseat of the car, my husband drives and I hold the puppy. (If he goes with me). When we arrive they weigh the crate and then the crate with the puppy. The puppy is placed in the crate and crate and puppy is weighed. Then then the paperwork is prepared at the counter. Documents such as health certificate is given to the airlines along with my photo id. I have some information to fill in like address and some signatures. I then provide method of payment which has to be credit card. This process can take 10 minutes to 1 hour or longer depending how fast the airlines are on that given day. 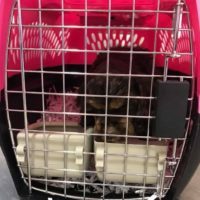 The puppy at this point is still in the crate and usually is licking the water or crunching on some puppy food and the flight is usually scheduled to leave in less than 1 hour. Once I get to my car and the puppy has been left with the airline I will email you to let you know that your puppy is on his/her way. The earlier the flight the sooner the puppy will get to you. Most flights go out about 6-10 am in the morning, having the puppy being there at 3 or 4 am and arriving mid afternoon to late evening depending on far away you live. Some flights are very short while others are longer. The night before I try to keep the puppy up with me as I am a late nighter and stay up very late, this way the puppy sleeps while on the flight and it is much easier that way. The puppy might get hungry on the flight. Got that covered too. The puppy goes to the airport with puppy food and water is supplied by the airline. Usually I put puppy bones/biscuits in with the puppy in the crate. The airlines tell us that we need to have absorbent material in the bottom of the crate in case of accidents. I use shredded newspaper. By putting this in the crate and putting bones/biscuits in the bottom of the crate it also is like a toy or a game of hide and seek. The crate is an airline approved crate which is able for the puppy to be shipped in. The puppy needs enough room to stand and sit in the crate. And no, we can’t ship puppies in boxes! Can I send you a crate that I already have? No, you may not send your crate that you already have. First, I do not know what type of disease may or may not be attached to that crate. There are also rules and regulations when shipping a puppy and the puppy must be able to sit, stand and move around freely. When booking a flight they need the size of the crate because they only have so much room on the plane. I will not take crates for shipping. Sorry. Because I don’t want a crate at my house that might be infected with some kind of disease. I am not saying you have a disease I just don’t want to take the chance. What do I need when I go to the airport? After I call the Airlines on most cases a Air bill number will be given to me. I will then in return give that number to you. Some flights you do not know until the day of what the air bill number will be, others you know right after I call them and book a flight. You will need that number in order to get your puppy so write it down in a safe place and somewhere where you will not forget it. Even though you are excited about your new puppy. Never take your puppy from the airport to a rest area or a gas station because the more traffic the more you are opening the possibility to having a disease being given by to your puppy. Make sure your puppy has a full series of shots prior to going to public areas. Never leave your puppy in the car! Dogs get hot very fast in a short amount of time and cars do not have proper airflow when the windows up. Some dogs are able to control window by a click of a button and they are out the window and down the road, either lost or even worse. Dogs are smart, give them credit. Do not let friends, family or neighbors, or other dogs come to your house until your puppy has a full series of shots. To arrive at the airport at least 1 hour ahead of time. Also, don’t forget to right down your reference or air bill number and take that with you. You will need that number in order to get your puppy. Very Important. Other things you might want to take with you to the airport. One dry towel in case of an accident in the crate. Cash to pay airline parking, short term parking. Possible food for you! If you have children most want pop or candy from vending machines while waiting for the puppy to arrive. Please give the puppy unconditional love and attention! After reading this if you have questions feel free to ask.